For a base beer I felt saison would be a natural choice, since the my favorite samples of the style are slightly tart and make for a refreshing summer beverage. I formulated a simple saison recipe with a small amount of Vienna malt to provide a little bit of maltiness to help balance the tartness and a late addition of Strisselspalt hops to complement the rhubarb with some berry-like flavors (which Strisselspalt is rumored to evoke, though I’ve never succeeded in getting a strong character from them). After pouring off the Fantôme to share with my fellow homebrewers, I dumped the drugs into a sanitized mason jar with a pint of 1.030 wort. I also decided to take a chance and pitch the Wyeast 3724 Belgian Saison strain, which is supposedly the Dupont strain, but is more likely just one isolate from several strains present in Saison Dupont. I adore Saison Dupont, but this strain is known for stalling unless kept very hot, and sometimes fails to reproduce the complexity of Saison Dupont even under ideal fermentation conditions. 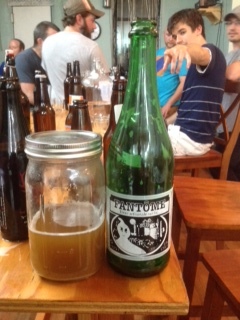 To circumvent these concerns, I plan to pitch some dregs from a bottle of Fantôme that I brought to Bitter & Esters’ bottle swap (since I didn’t have any homebrew to share). This will hopefully add some complexity from the wider diversity of microbes as well as help bring the beer to the target final gravity in a timely manner. The starter has shown very little activity, but appears to have fermented somewhat because it fizzes when I swirl it, indicating some dissolved CO2. If worst comes to worst and fermentation stalls, I am prepared to pitch some US-05 dregs from my Lazy Day Ale to finish the job. This go round, I managed to hit my mash temp of 148 F spot-on by simply guessing at the adequate temperature (168 F) for the amount of strike water I was using (18 qts). I also did a better job of making volume measurements this time around and was able to collect the right amount of total wort with my sparge (6.5 gallons total, boiled down to 5 gallons after chilling). The only big surprise on brew day was that my efficiency was higher than I estimated, so rather than hitting my target OG of 1.052 I overshot it at 1.058. I pitched a lively starter of Belgian Saison off of the stir plate into the oxygenated 75 F wort, which I subsequently cooled to 73 F. For the first day I held it around 75 F, but afterwards I’ve let the temperature rise freely, keeping the fermenter in a water bath only to add thermal mass so the temperature doesn’t rise too quickly. After three days I added the Fantôme dregs to the fermenter too, bringing the temperature up to 81 F. I couldn’t get it much hotter using the water bath and left town for the weekend, which meant the fermentation remained around 80 F and activity slowed down. I was surprised to find just how high it stalled out – 1.036! So after 11 days I also added the US-05 dregs. I’m really hoping this beer will dry out one way or another. The unintended high gravity may actually prove to be a boon, because it enables me to make my syrup at low sugar density, packing in more rhubarb (which is relatively low in sugar) without overpriming the finished beer. In that spirit, I’ve also decided to add the syrup to half of the batch to keep the rhubarb to beer ratio between 1.5 and 2 lbs/gallon (I’m not sure of the exact weight of rhubarb I used after trimming away bits that didn’t look so good). 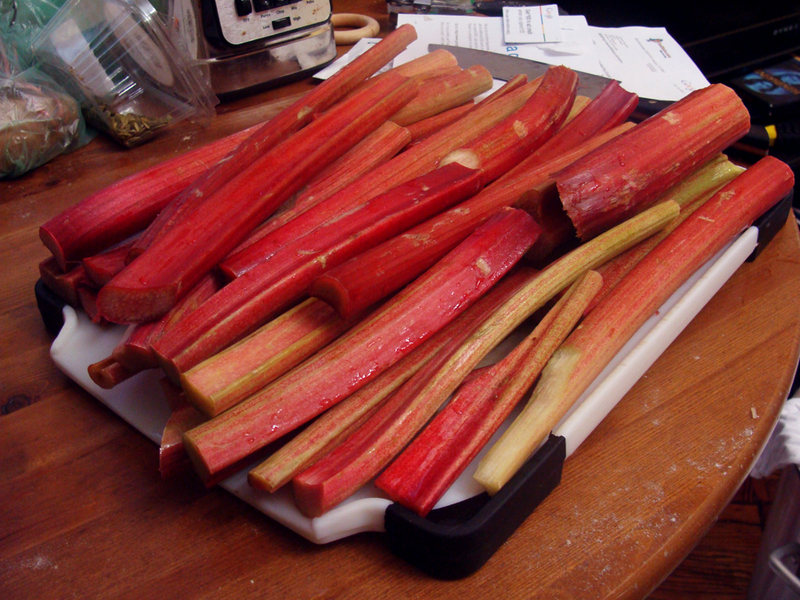 Rhubarb season is over, so there’s only a small amount still available and it costs more than most fruits by weight, so I decided to only take the best looking stalks available and split the batch. Hopefully in about a month’s time I’ll be comparing he two versions. I couldn’t get much life out of Phantome dregs either. Nice blog, thanks. I’m a little surprised it didn’t work much for either of us, because I’d read accounts online of people pitching dregs from the bottle (without even stepping them up in a starter) and having that mix of yeast and bacteria come to totally dominate the resulting beer. I ended up bottling this up to make space in the fermenter. I didn’t add any priming sugar, but the bottles are building up pressure (I’m bottling in plastic so I can feel the pressure rise in the bottle), so something is definitely still eating the sugars in there. I suspect it’s the Fantome dregs, since there is some Brett in there, but it really could be any of the yeast that I added.